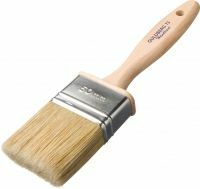 The jumbo brush is a flat brush with long bristles and a 30 cm long handle. The angled shaft is ideal for hard to reach areas. This brush lies comfortably in the hand! The width of the brush is 75 mm. 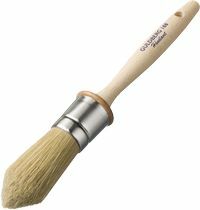 Handcrafted jumbo brush for wood work and varnish with an angled shaft. Genuine light Chinese bristles and an unlacquered handle. Suitable for all types of paint. The jumbo brush is a flat brush with long bristles and a 31 cm long handle. The angled shaft is ideal for hard to reach areas. This brush lies comfortably in the hand! The width of the brush is 50 mm.